The purpose of this book is to provide the reader with a perspective on apraxia that considers a link between the pathology of apraxia and normal motor skill. In addition, it is the intention of the authors to provide information that is theoretically interesting as well as clinically applicable. The book is a collection of papers by various authors working in the area of apraxia, almost exclusively with limb aparaxia specifically. 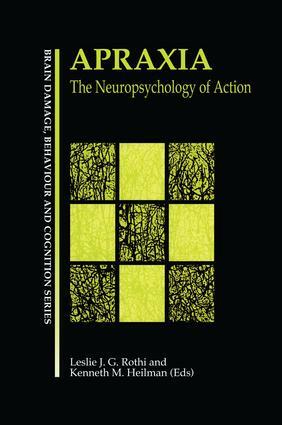 Beginning with Hugo Liepman's work of the late 19th century, a cognitive neuropsychological model of limb apraxia is reviewed, the use of new technologies that are informative about the mechanisms of limb praxis are discussed, and issues related to research as well as clinical assessment/management of the disorder are provided. While acquired limb apraxia is the focus of the book, there are also chapters on handedness, developmental apraxia of speech, and disorders of handwriting. L.J.G. Rothi, K.M. Heilman, Introduction to Limb Apraxia. K.M. Heilman, L.J.G. Rothi, Limb Apraxia: A Look Back. K.M. Heilman, Handedness. L.J.G. Rothi, C. Ochipa, K.M. Heilman, A Cognitive Neuropsychological Model of Limb Praxis and Apraxia. A.M. Rayer, C. Ochipa, Conceptual Praxis. L.J.G. Rothi, A.M. Raymer, K.M. Heilman, Limb Praxis Assessment. L.M. Maher, C. Ochipa, Management and Treatment of Limb Apraxia. H. Poizner, A.S. Merians, M.A. Clark, L.J.G. Rothi, K.M. Heilman, Kinematic Approaches to the Study of Apraxic Disorders. D.L. Harrington, K.Y. Haaland, Representations of Actions in Ideomotor Limb Apraxia: Clues from Motor Programming and Control. S.Z. Rapscak, Disorders of Writing. P.A. Square, E.A. Roy, R.E. Martin, Apraxia of Speech: Another Form of Praxis Disruption. B. Crosson, Subcortical Limb Apraxia. M.K. Morris, Developmental Apraxia. M.F. Schwartz, L.J. Buxbaum, Naturalistic Action.